The ChessEdu.org curriculum is designed to use chess as a tool for teaching problem-solving, creative thinking, and abstract reasoning in a classroom setting, be it in a public or private school, home school or other institution, or for personal use. Chess provides the opportunity to teach students how to think their way through solving complex problems, and it is a terrific way to introduce STEM, STEAM, and Common Core criteria. Children enjoy chess as a game. Yet, chess offers the means of teaching mental abilities used throughout life: concentration, critical thinking, abstract reasoning, strategic planning, problem solving, visualization skills, creativity, and patience to name just a few. Studies have shown that routine chess instruction has a positive influence on both numerical and verbal aptitudes. Links to various studies and other material can be found on the ChessEdu.org resources page. And the habit of not being discouraged by present bad appearances; the habit of persevering in the search of resources. Learning chess can also have an impact on behavior and social skills. As reported in the Boston Globe of February 12, 1996, educators are discovering a correlation between chess and “a curb in discipline problems.” They feature a student who “routinely used to fly into temper tantrums, becoming so disruptive that he was transferred to a special education class for children with behavioral problems.” The article states some of the “most successful players have come out of the class reserved for students with behavioral problems.” And that “students are calmer and the discipline problems have lessened.” Even some of the parents were surprised at the changes within their children. Anyone can implement the ChessEdu.org curriculum. One does not need to be an accomplished chess player to begin. 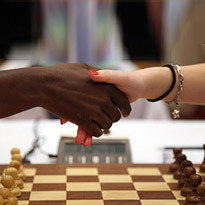 In the Chess Instructor 2009, International Master Michael Basman relates the following anecdote regarding chess instructors: “I began to look for people who were friendly and who were able to relate to other people. One of them was a lady who was serving customers in a grocery store. She was always very kindly talking to everybody, so I thought: that’s a good chess teacher. She couldn’t play, so I taught her. Now she still teaches chess for me and her classes are very popular. I was meeting people everywhere, and recruiting my teachers. I didn’t care whether they were good at chess, I wanted them to have the right personality.” Nonetheless, the teacher should review the material in every lesson prior to each class. To help capture the imagination of the student, we have organized the ChessEdu.org curriculum around a belt system similar to that of Brazilian Jiu-Jitsu. As students progress, the teacher can print out the belt certificates as a means of reward and to recognize achievement. The ChessEdu.org curriculum is a work in progress, so check back often for the latest updates. We view the ChessEdu.org curriculum as an open-source project; we welcome your contributions and recommendations. If you have a lesson or puzzle, or an anecdote, or advice, let us know! ChessEdu.org, Inc. is a registered 501(c)(3) non-profit corporation. Our White Belt Curriculum is now available for download. Our Blue Belt Curriculum is under development, but we need your help to complete this project. Please donate at ChessEdu.org. We appreciate your support! "The ChessEdu.org White Belt Chess Curriculum is a great way to introduce beginning players of all ages to the fascinating world of chess. The curriculum includes chapters on the history and rules of chess, the value of the pieces, instructive chess problems, and basic mating patterns. There is also helpful information on setting up a chess classroom and the benefits of learning chess and applying these logic skills to other fields." "Truly impressed with the ChessEdu.org curriculum, I’m honored to learn that my previous efforts at developing such a syllabus have been a guiding beacon. Indeed, Mark Donlan’s wonderful program is everything I’ve aimed for and much, much more. I congratulate him for creating this masterwork of chess education." Make a $25 (or more) tax deductible donation to ChessEdu.org and we will send log in details to access all archived content at ChessCafe.com - including thousands of PDFs and hundreds of eBooks!